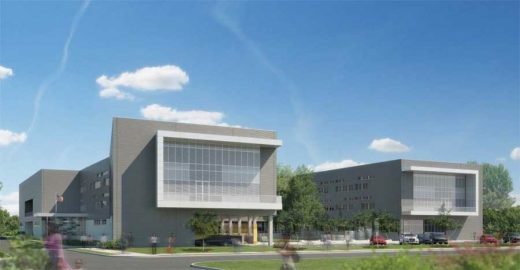 Eskew+Dumez+Ripple is providing architectural services for this post-Katrina replacement high school for the Louisiana Department of Education Recovery School District. L.B. Landry High School retains an important place in the city’s history. The school was founded in 1938 as the first high school in Algiers that African-American residents could attend and the second black high school established in Orleans Parish, after McDonogh 35. The 210,000 square foot building will serve a student population of over 900 students and contains a 1000-seat gymnasium, a 250-seat auxiliary gym and a 650-seat auditorium. Additional performing arts spaces include classroom and rehearsal spaces for dance, choir, band and art as well as a black box theatre. The design establishes academic ‘houses’ for each grade level provided within two classroom wings. 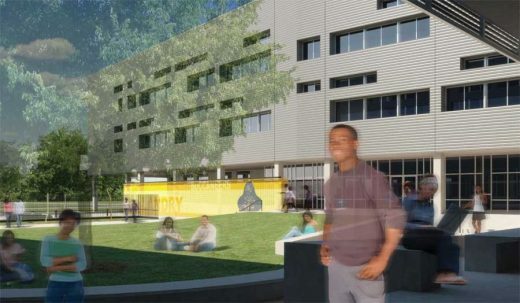 These are organized to create a central courtyard as an outdoor space for the student body – similar to that of the previous school — focused around a mature existing Magnolia Tree. 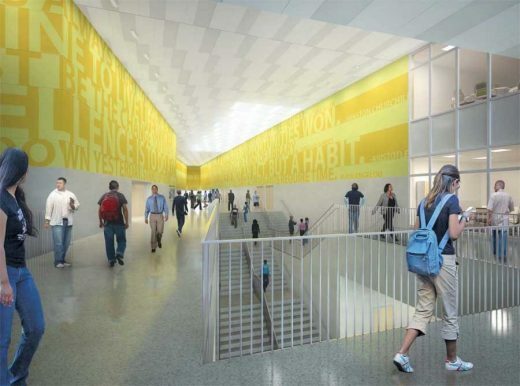 The design of the building includes sustainable elements that will achieve a LEED for Schools Silver certification.